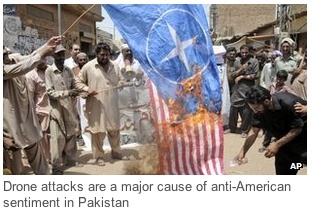 US military drone attacks in Pakistan raise serious legal questions, the UN’s human rights chief has said. Navi Pillay was speaking at the end of a fact-finding visit to Pakistan. Drone attacks have become a central part of US counter-terror operations but Ms Pillay said they were legally problematic. “Drone attacks do raise serious questions about compliance with international law, in particular the principle of distinction and proportionality,” Ms Pillay said. “Ensuring accountability for any failure to comply with international law is also difficult when drone attacks are conducted outside the military chain of command”, she added. Ms Pillay also voiced concerns that the strikes were being conducted “beyond effective and transparent mechanisms of civilian or military control”. The only question is why the world does nothing while the USA carries out these terrorist attacks against innocent civilians.